Wondering how much you could get for your car? Looking for car prices to purchase? Maybe you're looking for a dealer nearby? Jack of Cars makes it easy to find car details including engine sizes and MSRP as well as find out your car's value. Use the Find a Dealer option to locate a dealer in your area. As you look up cars in Jack of Cars, it remembers your specifications so you can quickly return a previously searched vehicle or perform a different function with the same vehicle. Jack of Cars can store up to 50 vehicles. Jack of Cars uses Edmunds.com, Inc. to determine values and get car and dealer information so you can be confident you are getting factual information as well as reasonable and agreeable prices. 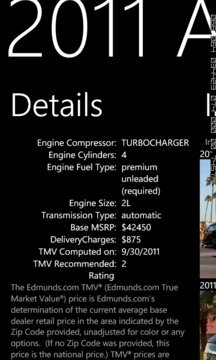 TMV® prices are copyrighted by Edmunds.com, Inc., which reserves all rights. 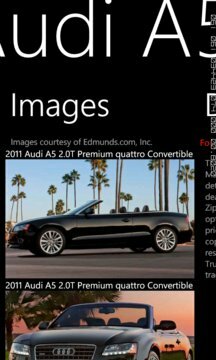 Edmunds®, Edmunds.com True Market Value® and TMV® are registered trademarks of Edmunds.com, Inc.